"Many People, Many Opinion"- this would be the appropriate line for CGL Tier-II 2013 re-exam. After the re-exam, some candidates says 'Math paper was easy, but English was tough', some says 'Math was tough, but English was easy'. But at the end, it can be said that the overall question papers (Paper-I & II) were quite tougher than that of previous year's exam. 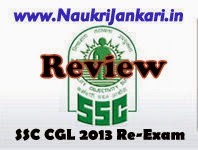 Now let's have look on paper-wise review of CGL 2013 re-exam. Well, when the exam of maths paper was started it had been seemed that the question paper was easier than previous year's exam. But whenever get into mensuration, geometry, the candidates felt horrible! The questions on mensuration were too lengthy and thus it took too much time to read out the questions! But after reading the questions (successfully! ), candidates stuck to solve the problem. As a result, lots of time were wasted such a way. It is very difficult to solve 60-65 questions correctly within the stipulated time. Questions were asked from Algebra, HCF/LCM, Profit & Loss, Percentage, Data Interpretation, Time & Work, Time & Distance, Mensuration, Geometry, Height & Distance etc.There are 1-2 wrong questions/ options. The English paper was seemed to be easy, but not easier than previous year's exam. There were 5 passages that contain total 30 marks and this portion was easy. But the questions on re-arrangement were too lengthy and this sections contains total 20 marks! So, imagine how much time you need to solve these! But overall this paper was average. On an average candidates are able to solve 160-170 questions. The re-exam for statistics i.e. paper-III was conducted on 20.09.2014. According to the candidates, the statistics paper was moderate. Some parts are easy, some are tough. But overall the question paper was a little bit tougher than previous year's question paper. We will publish soon the pdf of the complete statistics question paper on this website. Friends, now your time to share here your attempts in SSC CGL 2013 re-exam held on 21st September, 2014. Also share your attempts in paper-III if you have appeared for. Attention: We will publish soon the expected cutoff marks of SSC CGL 2013 re-exam (tier-I + II) here. Stay Tuned! 3 comments for " Review on SSC CGL 2013 Tier-II Re-exam held on 21.09.2014 "
Can anyone pls tell me..OMR sheet me whitener use kar sakte hai kya..Ticket no likhte waqt i made a mistake..pls advice..
Don't worry. Using whitener will not create any problem.